Greg hosts a special show from the roof of the O2, whilst relaxing in a hot tub. Including Smack the Pony, Philomena Cunk's Moment of Wonder and Making Love Actually. Browse content similar to Greg Davies' Hot Tub Half Hour. Check below for episodes and series from the same categories and more! 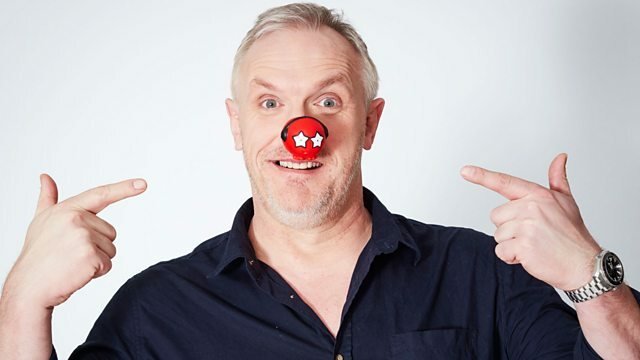 Hello, I'm Greg Davies, and you're watching Red Nose Day 2017.
unhappy I am. You're in a hot tub, cheer up! You shot your mouth! understand you have a soccer kick around every Sunday in your village? chair... There's so much wrong with that, I don't know where start. cheese phobic. Dairy intolerant? No, I'm just afraid of it. Oh! Makes you look... Really fat! Really old. my next guest. It's Tom Daley, the diver. Are you not hot in that suit? that we can compare our bodies? That's a good idea, isn't it, Tom?! the hot tub?! Yes, into the hot tub. I can't dive into two foot of water. because one in four of us will experience a mental health issue. that. You think without the Centre things would be different? Yes. from the Kaiser Chiefs. Let's do a heartfelt charity single! It is going to be wet and wild (and probably windy) as Greg Davies bravely hosts a very special half hour of top comedy from the roof of the O2, whilst relaxing in a hot tub. Greg is joined in his tub by some very special guests, including the ladies from iconic sketch group Smack the Pony, who are reuniting after 13 years to perform together again. There is also comedy from Philomena Cunk in a Moment of Wonder, grilling Richard Curtis about Comic Relief, and an exclusive sketch from the hottest new comedy stars in This Country. Frankie Boyle and Rebecca Front star in an exclusive sketch following a group who are addicted to heckling at comedy clubs, and if that wasn't enough, we go behind the scenes to reveal how the sequel to Love Actually was made in Making Love Actually.